Outdoor wicker dining furniture has become extremely popular over that past ten years. Wicker furniture used on patios is elegant and versatile and withstands the adverse outdoor conditions better than most other outdoor furnitures retaining its original feel and look. Selecting wicker dining furniture for your courtyard will ensure you enjoy breakfasts, lunches and dinners in comfort and in style for a very long time to come. Wicker dining furniture is unique and in addition to great functionality, it will make your patio a show place. The resins used in quality outdoor wicker furniture are available in variety of colors and types. Tables come in all shapes and sizes and can be matched with various chair styles. Square, round, rectangular and oval wicker tables provide a nice variety of outdoor dining tables to choose from and allow families to choose a style and size thats right for them. Select basic armless side chairs for an efficient seating arrangement or armed chairs that provide a more formal touch to outdoor dining. Dining chairs with arms can be used for the dining table or in a casual seating arrangement. So, if you not averse to sliding your arm chairs back and forth from the table to your sitting area, you can save by double dipping and using them for both purposes. You can accent chairs with tufted seat cushions for a soft comfortable seating experience using a fabric that best suites your decor. 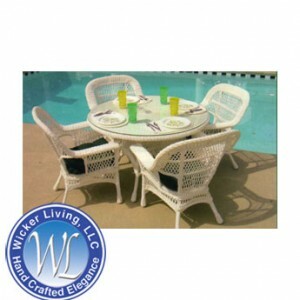 Many retailers offer wicker dining sets that seat from four to six people. Round tables ranging in size from 36, 42 and 48 inches are a good choices because you can select a size that meets your needs. With larger tables, its easy to squeeze in an extra chair or two if you need to to fit another person at the table. Its also a great idea to own a bistro table and chair set to use when there are only two of you. Bistro table and chair sets are a cozy alternative to dining at larger tables. They are easy to move and can be placed on balconies, porches and under shade trees for a comfortable relaxing meal. Moving the smaller table to follow the shade is something that many of us need to do. So, having a smaller table is a nice thing to have rather than having to move a larger table and set of chairs when there are only two of you using it. Woven wicker dining table tops look exceptional. However, they are not level enough to use without a glass top that will provide a level surface to keep water and wine glasses from tipping. Therefor, all wicker dining table are, or at least should be sold with a glass top. The glass tops also make them easy to clean between meals. Learn more about maintaining your dining table glass top so you can keep your top from sliding. When shopping for outdoor wicker dining furniture, choose wicker furniture pieces individually or buy them as a set that meets your needs. Choose from round, square or oval shapes and select cushions and fabric that complement your decor. Make sure your table includes a glass top to ensure a level surface and easy cleaning between meals. Check back for our next article to learn more about wicker furniture cushions.